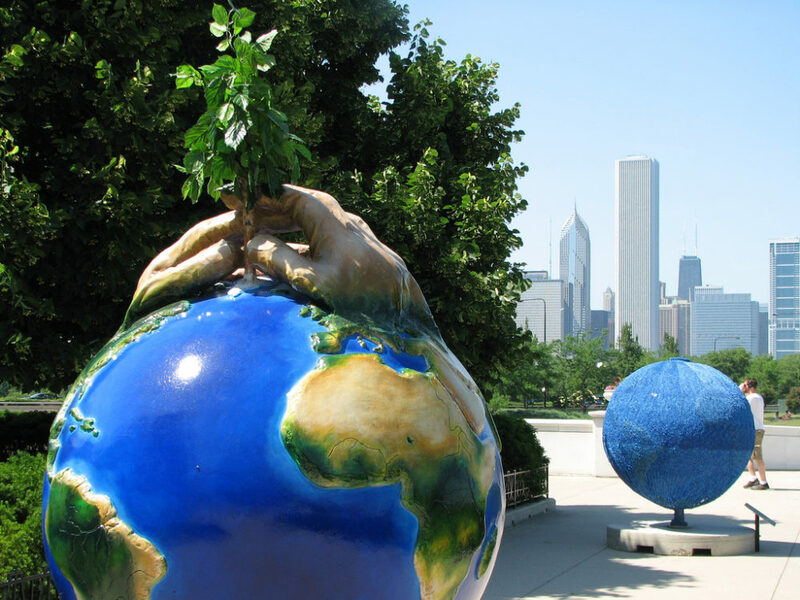 A 2007 public art show in Chicago urged stronger action on climate change. With the Trump administration expected to roll back federal climate policy, advocates are hoping states and cities will pick up the slack on reducing carbon emissions. Chicago is often touted as a leader on this front thanks to its solar, energy efficiency and other programs, along with the 2012 closure of two urban power plants and city officials’ action against petroleum coke storage. Now a majority of City Council members and the Chicago chapter of 350.org want the city to make a statement against the fossil fuel industry by pledging to divest the city’s pension funds and stocks and bonds. A divestment resolution was introduced in December, and backers are hoping it will be heard by the full council this spring. The measure would be largely symbolic, since a resolution is non-binding and the state government is in charge of pension investments. But supporters say that the resolution would send a powerful message and could be followed by a city ordinance that might mandate some divestments. Forty of the council’s 50 members have co-sponsored the resolution. The chief sponsors are Sue Sadlowski Garza, part of a prominent family of union steelworkers and a leader in the battle against petcoke storage in her ward; and John Arena, one of the council’s few long-time independent members and a leader of the Progressive Caucus. The proposed resolution notes that “the consequences of climate change stand to make Chicago a less desirable place to live and work, negatively impacting the fiscal and social health of the city.” It cites predictions published in the city’s climate action plan that the city could see “heat waves as strong as the deadly 1995 Chicago heat wave – in which 739 deaths occurred – several times per summer.” It also notes that ozone levels could increase 10 to 50 percent; precipitation could increase 25 percent; and there would be increased risk of Lyme disease and West Nile virus in the area. Thirty-four cities nationwide have vowed to divest from fossil fuels, typically defined as the 200 publicly-traded companies with the largest coal, oil and gas reserves as identified by the Carbon Tracker Initiative, the resolution says. Chicago would be the largest city to divest and one of relatively few in the Midwest. Minneapolis and Madison also pledged to divest. Worldwide, institutions worth more than $5 trillion have divested from fossil fuels, with governments making up 18 percent of the total institutions, according to 350.org’s Fossil Free project. The parliament of Ireland — where many Chicago residents and politicians have roots — voted to divest the country’s strategic investment fund from fossil fuels in January. Lindsay Meiman, national spokesperson for 350.0rg, said most divestment commitments are through non-binding resolutions, and the group is not able to track what divestments are actually made since the information is typically not public. Chicago has four employee pension funds – for police officers, firefighters, municipal employees and laborers. The resolution calls for divesting those funds and the city’s stock and bond holdings from fossil fuels within five years, and asking fund managers of any commingled funds to move the city’s investments out of fossil fuels. It also calls for investment in renewable energy. In a city and state where pension funds are in crisis from short-sighted past decisions, supporters of divestment say that it is financially in the best interests of city employees, elected officials and residents. Coble joined the 350.org Chicago group not long after it was founded, about three years ago, motivated by responsibility to his now-13-year-old son. He noted that 350.org’s membership grew exponentially almost overnight after Trump’s election. David Bietila, 40 and a university librarian, joined the group after the election. He was eager to become active on climate, and his mother, a retired nurse and artist in Madison, suggested 350.org. He said the resolution could be an important victory even if it is purely symbolic. “A lot of it is to get attention to this issue in local media, to show that a big city would support divestment,” he said. “It contributes to an overall climate where people are more and more aware of climate change, it shows fossil fuels as morally not acceptable, and shows that there are other options.